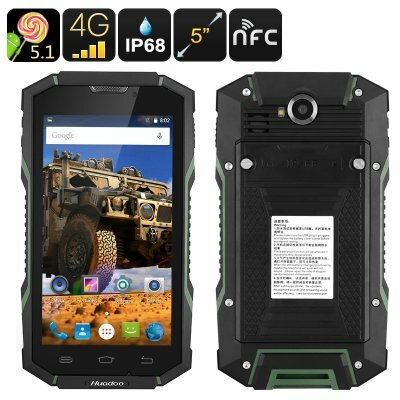 Successfully Added Huadoo HG06 Rugged Smartphone - IP68 Rating, 4G, Quad Core CPU, 2GB RAM, Android OS, NFC, OTG, 5 Inch Display (Green) to your Shopping Cart. Huadoo has a reputation for producing high-end rugged Smartphones at affordable prices, and their latest model the HG06 is no different. With an IP68 rating, this rugged phone brings top tier protection from water, dust and shocks. A tough plastic and rubber exterior makes it clear that the HG06 is a highly rugged device and ready for action. Able to withstand submergence in water, protected from dust ingress and resistant to shocks, this handset isn't afraid of water, dirt or rough environment making it a hit with construction workers, farmers, first responders, engineers and adventurers who need a reliable phone for all conditions. This 5-inch Smartphone has a quad-core CPU and 2GB of RAM bringing a strong performance capable of gaming, multi-tasking, streaming media and all other daily tasks. Its 720P display has good brightness and a rich color depth so will look good no matter where you are. With 4G connectivity, the phone brings great network coverage and has comprehensive 2G and 3G support so you can get reception in most corners of the globe. Equipped with NFC the Huadoo HG06 can be used for quick contactless data transfers, such as those used with e-wallets. This allows you to use it to pay for goods and services such as bus ticket, groceries and more. added to all these features is a substantial 3600mAh battery to bring exceptional usage times so you can be sure the phone has enough juice to keep up with your active life. The Huadoo HG06 rugged smartphone comes with a 12 months warranty, brought to you by the leader in electronic devices as well as wholesale android phones and gadgets..